Sophisticated, elegant & contemporary, this newer 6 bedroom, 5 bathroom home offers you quality finishings throughout. Main floor has open plan living including expansive floor space in both living & dining areas with vaulted ceilings. 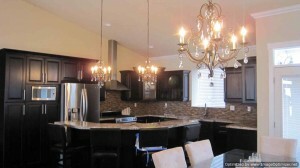 Stunning gourmet kitchen with dark cabinets & large centre island. 4 bedrooms on the main level with the large master having a gorgeous river view, coffered ceiling & spa-like ensuite including a 2 person Jacuzzi tub & fully tiled shower. Luxury features abound in this home including granite countertops, crown mouldings, 3 sets of French doors with transoms, hardwood flooring, polished tile, lush carpet & high end lighting package. Lower level features a self contained suite that can be configured as a 1 or 2 bedroom. Security system, hot water on demand, heat pump, high efficiency furnace are just some of the practical aspects that ensure this home is the perfect choice for you. Backing onto greenspace with fully a large fenced yard.